When somebody submits a link for a car and claims it checks all the boxes, I'm always skeptical...a glass is half full of gin kinda guy. And my boxes are kinda strange and kinda hard to check. So let's see...manual gearbox, check; brown/gold exterior color, check; turbo power, check; wagon, check; decent price, check. Okay...yup...checks all the boxes. 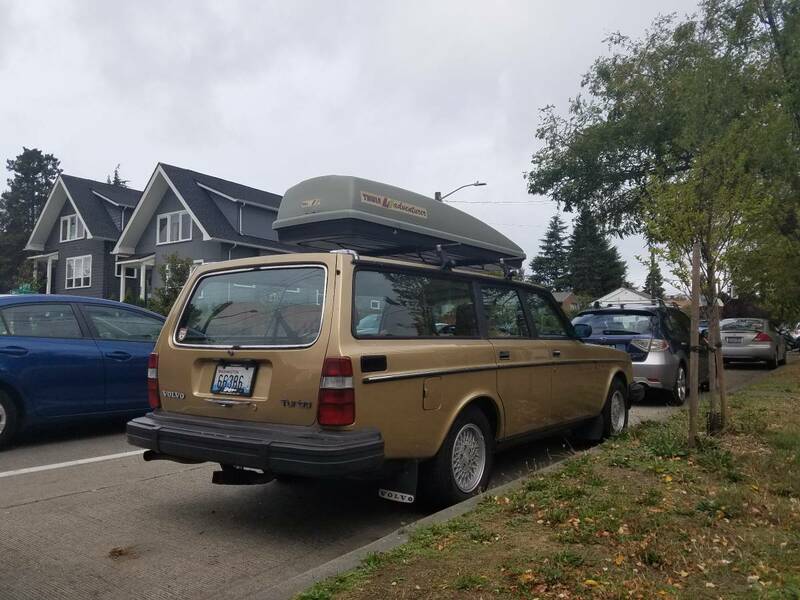 Find this 1982 Volvo 245GLT offered for $4,000 in Ballard, WA via craigslist. Tip from Art C.
For sale is my 1982 Volvo 245GLT Turbo with the manual M46 transmission (4spd with electronic OD) and B21FT. If you are looking at this ad then you likely know exactly how special this car is. First year of the turbo 240 wagon and comes with the sought after M46 manual transmission. 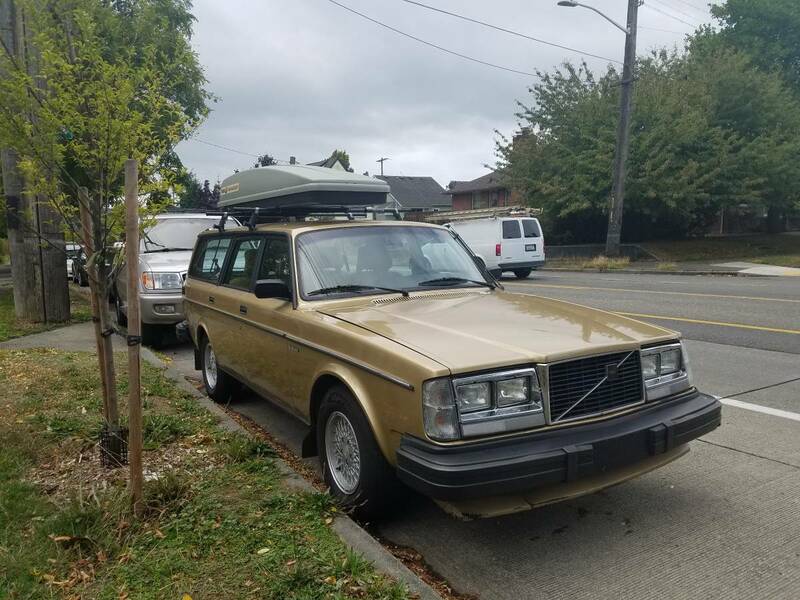 This Volvo has a clean title and is a low mileage survivor. Here is the important things to know about this specific turbobrick, all the listed points below have been installed within the last year. Along with the recent mechanical work, I have also exhaustively refurbished the entire interior and exterior. Very good condition interior seats/carpets/dash/door panels have been swapped over from an '89 240 I owned. Also installed is an aftermarket Sony stereo deck and new Pioneer 4" door speakers. Exterior paint has been professionally reconditioned (Rotary buff, DA cut and polish). Although a Thule roof box is pictured, it IS NOT INCLUDED with the sale. The Yakima gutter roof bars will come with the car. It also sits on 14" Volvo Scorpius wheels sourced from a '93 240 Classic Edition with newer (less than a year old) Hankook Optimo tires. A new front suspension kit (ball joints, strut inserts, outer tie rods, control arm bushings, front pads and rotors) can possibly be included in the sale, in addition to a few boxes chock full of 240 and k-jet parts. It doesn't need any suspension work as it sits (these were parts that I bought and planned on throwing in a different 240 that I owned, and it would certainly tighten up the ride). Always run on premium octane fuel. After spending years searching for a clean 245 Turbo I know what this car is and how difficult it can be to find a clean example. I simply have too many cars and a different old Volvo that Id like to focus on. I do not mind sitting on this and am in no rush to sell. I don't get the chance to drive it as much as I should and as such I would like to see it go to another Volvo enthusiast and loving home. Since purchasing this vehicle, I've put over 7000 trouble free miles on it. This vehicle is 100% daily drive-able as it sits. Its an absolute hoot to drive and has plenty of scoot with that old school '80's turbo experience. If you'd like to talk about it or have any additional questions, please feel free to text me at show contact info or shoot me an email. Please do not call, as I do not answer unknown numbers. 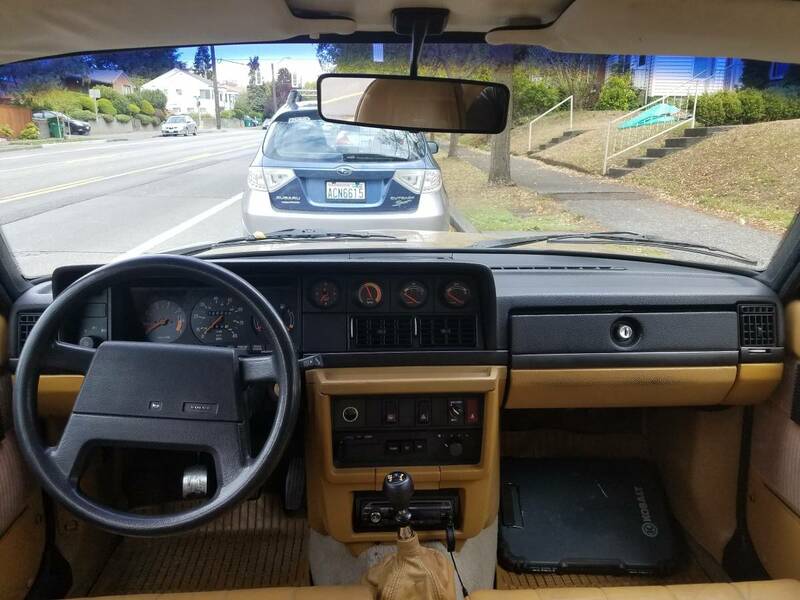 Users over at BaT (of which I am one) denigrate owners selling cars on craigslist as posting ads that are sparse on details, short on photos, and semi-literately written. This is an example of an ad that defies those criticisms. I have bought and sold cars on cl for years, writing ads like this one and responding to ads similarly written. And damn, I wish this car were on the east coast!